I recently visited the National World War I Memorial in Kansas City. During this visit, I found myself drawn to a glass rooftop at the base of the memorial (it was the roof for the museum below the memorial). 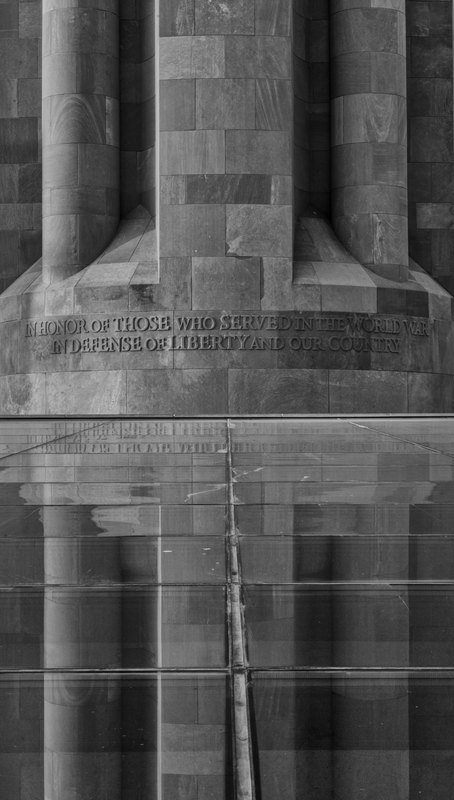 The shiny glass reflected the memorial beautifully, so I took two photographs to capture that reflection. The first shot was taken during the day and highlights the reflection of the inscription at the base of the tower. The second photo was taken at dusk, when the lights on the tower illuminated the scene. I couldn't decide which I liked better, so I thought I'd post them both and let you pick! Which of these two shots do you like more? Leave me a comment and let me know!